The Estadio Alberto J. Armando (formerly the Estadio Camilo Cichero) is a stadium located in the La Boca district of Buenos Aires. Widely known as La Bombonera (the Chocolate Box) due to its shape, with a "flat" stand on one side of the pitch and three steep stands round the rest of the stadium. It has a capacity of 49,000. The stadium is owned by Boca Juniors, one of Argentina's most famous football clubs. The unusual shape of the stadium has led to it having excellent acoustics and the Boca support being nicknamed "La Doce" (The 12th man). Three sides of the Bombonera are made up of traditional stands. However, the fourth side had to be built vertically, with several seating areas stacked one on top of the other, to stay within the stadium's property. La Bombonera is renowned for vibrating when fans start to jump in rhythm. In particular, the unique vertical side will sway slightly, leading to the phrase " La Bombonera doesn't shake: it beats (like a heart)." As well as being the home of Boca Juniors the stadium is also used as a concert venue, with the likes of Lenny Kravitz, Elton John, James Blunt, Bee Gees, Backstreet Boys and Cast having performed there. Palermo is a neighborhood, or barrio of the Argentine capital, Buenos Aires. It is located in the northeast of the city, bordering the barrios of Belgrano to the north, Almagro and Recoleta to the south, Villa Crespo and Colegiales to the west and the Río de la Plata river to the east. 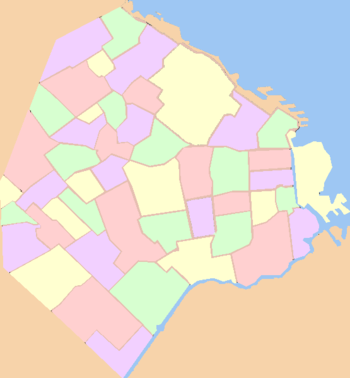 With a total area of 17.4 km2 (7 sq mi), Palermo is the largest neighborhood in Buenos Aires. 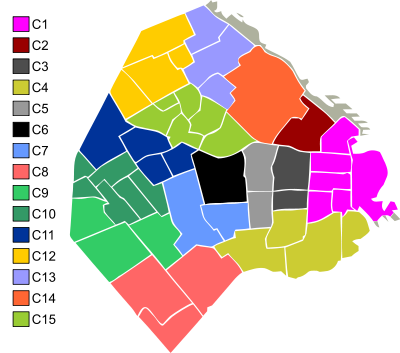 As of 1991 it had a population of 256,927 inhabitants (1991 census [INDEC]). It is the only barrio within the administrative division of Comuna 14. Alto Palermo is downtown Palermo, the main shopping area and transport hub around Santa Fe Avenue. At its core is the Alto Palermo Shopping Centre, a large shopping mall. Palermo Viejo (Old Palermo) is, as its name implies, the oldest part. The neighborhood is centred on Plaza Palermo Viejo and reflects an older Spanish style in architecture, often "recycled" with modern elements. Palermo Soho is a small area of Palermo Viejo near Palermo's south-western edge. It is a newly fashionable area for fashion, design, restaurants, bars and street culture. In the mid-nineties a number of TV and Radio producers installed themselves in the area between Córdoba, Santa Fe, Dorrego and Juan B. Justo Avenues in Palermo Viejo. For that reason this part of the neighborhood began to be called Palermo Hollywood. The most upmarket part of Palermo, Palermo Chico ("Small" or "Exclusive" Palermo), is on Palermo's north-eastern edge, across Figueroa Alcorta Avenue and between San Martín de Tours and Tagle streets. Las Cañitas was a tenement district early in the twentieth century; but it has since become an upmarket area of high-rises, restaurants and bars next to the Campo Argentino de Polo, in the northern half of Palermo.